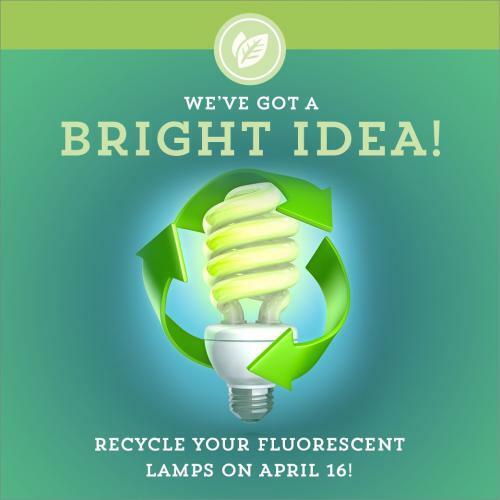 To celebrate Earth Day, Columbus Water & Light is helping local residents and businesses recycle fluorescent light bulbs. Join us from 8:00 am to 4:00 pm on April 16th! Columbus residents can recycle up to 12 light bulbs and four ballasts per person for free. Please deliver tube lights in boxes and do not tape bulbs together. Businesses interested in participating in the event can contact our office or send an email to cwl@columbuswaterandlight.com. The Environmental Protection Agency (EPA) recommends that consumers recycle compact fluorescent lamps (CFLs), fluorescent tubes and other bulbs that contain mercury, rather than disposing of them in regular household trash. Mercury is a toxic substance that is released into the environment if bulbs are broken or sent to a landfill; keeping it out of landfills reduces negative impacts to both environmental and human health. By recycling a mercury-containing bulb, you will ensure 99.98% of the mercury is recovered. Columbus Water & Light asks that you consider replacing your existing fluorescent lights with LEDs, which can save you 50 percent on your electric bill and contain no hazardous materials.